Ever an intellectual and independent thinker, the Czech modernist architect Alfred Neumann (1900–1968) believed in the artistic role of architecture as the poetic and utilitarian shaping of a “humanized” space. Yet while he achieved professional recognition internationally, Neumann was never fully accepted by the architectural establishment in his adopted country, Israel, and remained a perpetual outsider. Space Packed: The Architecture of Alfred Neumann by Rafi Segal is the first book to examine his unique work. 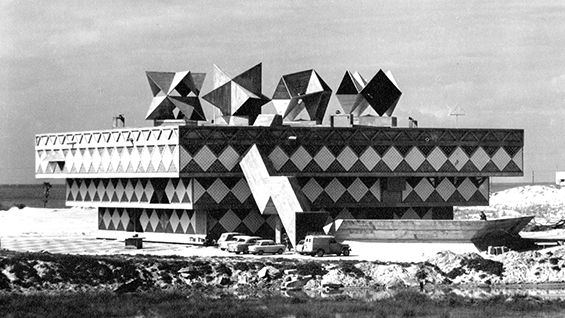 Departing from the expressions of the International Style of modern architecture popular during his lifetime, Neumann instead conceived of buildings as spatial assemblies of repeated, stacked, and interconnected polyhedral units scaled proportionally to the dimensions of the human body. Neumann’s design method reconciled the longstanding practice of conceptualizing buildings as standalone objects with a newer mode of treating architecture as patterns.